In spite of the time you spend online to lock in the best deals and prices, planning your upcoming vacation is mostly fun. But once you get ready to pack, notes Rick Seaney, CEO of FareCompare.com, you need to be wary of overweight bag fees and other nasty surcharge surprises. Bling. Leave the good stuff at home and in a safe place. It’s easy to lose jewelry when traveling, and robbery, while uncommon, does happen. If you must take those diamond studs, wear them. 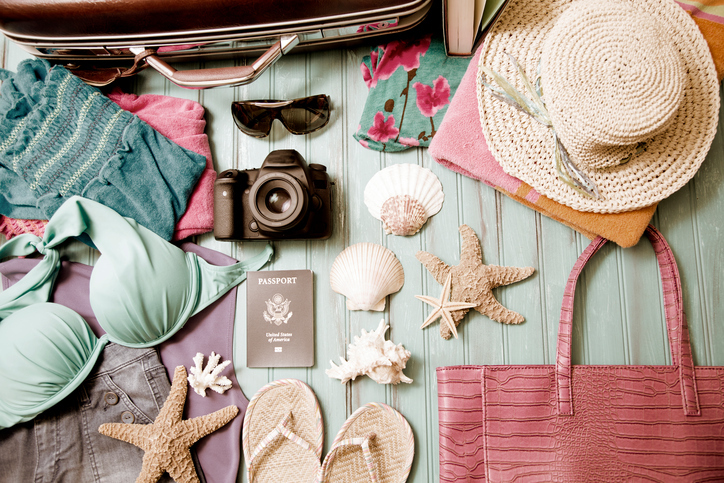 And before you pack expensive items, ask yourself whether losing them would ruin your trip. Too many credit cards. All you need is one, with your partner or traveling companion carrying another. Leave the card numbers with someone at home in case of loss or theft. Gloppy food. At the cost of airline food these days, it’s tempting to pack your own snacks. Just don’t pack anything remotely ‘liquidy’—like salsa or jam, no matter how well you think it’s contained. It’s also important to stay hydrated. Take an empty water container in your carry-on and fill it from a water fountain after you go through security. Heavy books. Avoid the weight of books in your suitcase and put anything you’re interested in reading on your favorite electronic device. The wrong deodorant. As far as the TSA is concerned, there’s a right and a wrong deodorant. While any size stick deodorant is allowed, sprays, gels, liquids, creams and roll-ons are only allowed in containers under 3.4 ounces. The wrong shaving gear. Pack any razor you want in a checked bag. If you’re traveling with only a carry-on, a safety razor with removable blades will not make it through security.